How do I change my Dropbox Account Password? I’ve been using the same password for a lot of different Web sites. My bad. Now I need to change ’em. How can I easily change my Dropbox password? I’m sure you don’t need me to tell you, but I will anyway: Don’t use the same password on multiple sites. It’s dangerous, even if you think no-one’s paying attention to you. The trick is that people aren’t paying attention, software is, and once they compromise a password or account database on one site, they add all those passwords to the “hack dictionary” that they use to try and break in to other sites. See the problem? All your accounts are then only as secure as the weakest site you visit and use that particular password. And there are some sites with awful server and database security! In addition to using a variety of passwords that are all rich and complex (we’ll get back to that) another thing you should enable on every site that supports it is two-factor authentication. Dropbox offers this capability, for example, and it means that even if someone gets your login credentials, they won’t be able to log in to your account and access your files without also having access to the secret 6-digit code that Dropbox sends you every time you’re trying to log in. Here’s an article on getting up and running with that: Set up two-factor authentication on Dropbox. But let’s just focus on the password question! Yes, I have over a terabyte of storage on Dropbox. Lots of space for video content! 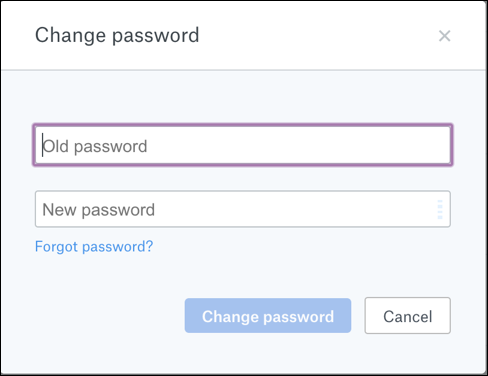 It’s not a bad idea to run a “security checkup” every now and then, but to change your password, click on, well, “Change password”. Pretty straightforward, really! Notice also that this is where you can enable two-step verification! As a reminder, good passwords should have upper and lower case letters, digits, a punctuation mark or two, and be at least 10 characters long in total. Got a good one? Enter it, then click the blue “Change password” button. So that’s it. Mission accomplished. All done. Not too bad at all, really.